Kalamazoo, MI: On Tuesday, July 10, 2018, at approximately 10:50 A.M., Kalamazoo Public Safety Officers responded to the 200 blk of W. Maple St. to arrest a 29 year old Kalamazoo resident on his parole absconder warrant. When officers made contact at a residence in the 200 blk of W. Maple St, officers located four subjects sitting in a vehicle parked in the driveway. 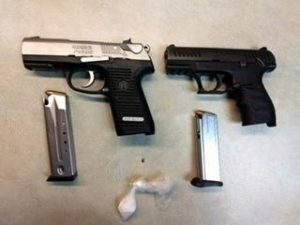 During the course of the investigation officers conducted a search of the vehicle and located two firearms (one stolen) and a quantity of methamphetamine. The wanted parole absconder was also located at the residence and was arrested on his warrant. Officers executed a search warrant on the residence and located additional firearms and drugs. In total four adult Kalamazoo men were arrested on various weapon, drugs charges, and warrants. On Wednesday, June 20th 2018, at approximately 1:39 p.m., Kalamazoo Public Safety officers were dispatched 628 Whites for reports of a subject that had been shot. While officers were enroute to the address the shooting victim was transported to the hospital and is currently in stable condition. The victim was identified as a 21 year old Portage resident. On Saturday, June 9th 2018 around 4:27 pm, Kalamazoo Public Safety officers responded to the 1300 block of E Main for reports of a subject who had been shot near Roosevelt Apartments. The victim has been identified as a 25 year old Kalamazoo resident who was suffering a gunshot wound to his stomach. The victim had been transported to Borgess Hospital for his injuries. His medical condition is unknown at this time. The Criminal Investigation Division is investigating this incident. This investigation is in its early stages at this point and no suspect information is known.